13 October 2017 - 15 October 2017. Some of the three greatest days of my life. I could ride the metro all day if it meant hearing the names of the stops being announced. That is my love of the French language. I have had an interest in French language and culture for many years. When I was young, my grandparents brought me home a small Eiffel Tower replica that sat on my shelf for many years. Time went on, I grew up, and my tiny Eiffel Tower replica sat on that shelf, watching me grow and change. From the time I was a sophomore in high school until I was a sophomore in university, I was continuously enrolled in a French class. 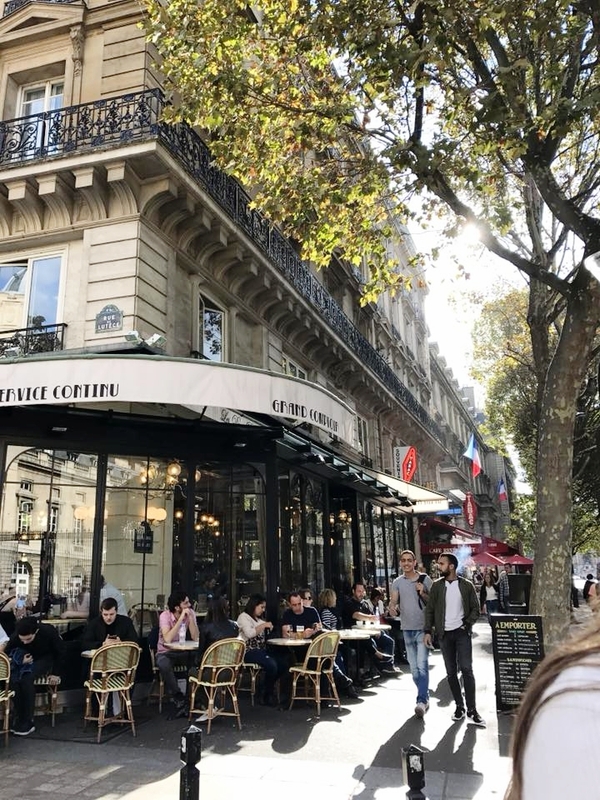 When Lauren Conrad turned down her once-in-a-lifetime trip to Paris, my heart broke: "how could she turn down the magic of PARIS? ", my twelve-year-old self thought. My love for Paris and my desire to throw myself into the French culture has been growing and blooming for years. At the beginning of October, one of my friends said, "Let's go to Paris". Despite my new standard of living, aka living on a serious budget, I said yes without thinking twice. Two weeks later, we were boarding an early morning airplane. Two hours after that, I stepped foot in France for the first time. After a few mishaps of getting to our Airbnb, we made it. Our Uber dropped us off on a beautiful, buzzing Parisienne street. It was exactly how I had always pictured it. Windows with fresh pink flowers. Cafes. Cigarette smoke. Tiny espressos. Paris was the dream I always knew it would be. After settling into our Airbnb and getting ready with my dearest Edith Piaf playing in the background, we were off. We saw what the tourists are meant to see - Notre Dame, the famous Louvre pyramid, and the shimmering Seine. A bird pooped on Anna's head, we laughed all day, and by five o'clock, we found ourselves in a backstreet, sipping white wine and watching Paris happen all around us. After a delicious dinner of burrata, fennel, and balsamic, and then Caesar salads, we were off to drink wine in front of the lit up Eiffel Tower. The first time seeing the Eiffel Tower up close is life-altering. Not for the primary reason of standing in front of one of the universal classic symbols of art, music, literature, history, and wine, but because it. is. so. massive. I wasn't expecting how powerful this tower would be, but there it was, standing in all of its powerful, strong, French glory. Towering over us, shimmering, shining its lights across Paris, and being the popular, beautiful spectacle the entire world knows it to be. The next morning was another day of exploring. 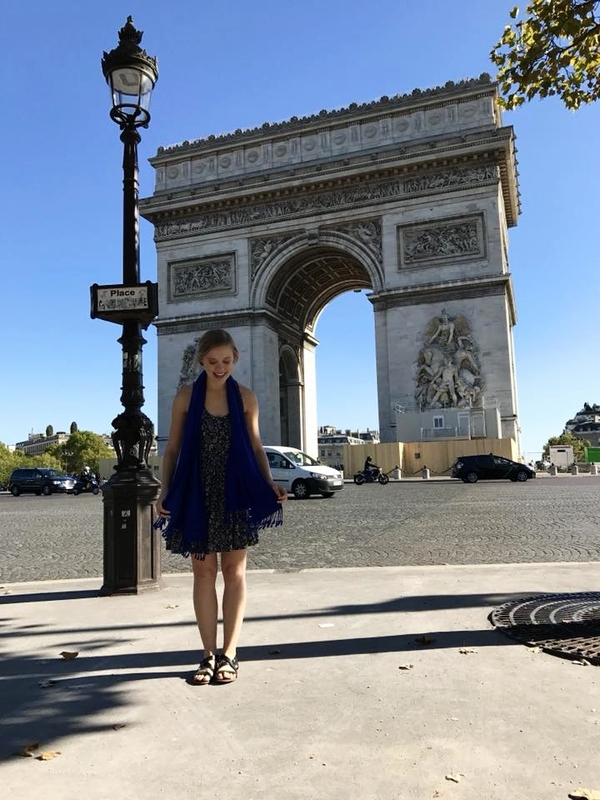 We started at L'Arc de Triomphe, admiring it, taking pictures in front of it, and in classic French fashion, having my dress go straight above my head when walking over air rising from a vent in the street. Yes, I Marilyn Monroe'd in front of l'Arc de Triomphe as cars drove by and two young Frenchmen cheered. I was embarrassed, but Anna and I just laughed and laughed. First a bird pooping on her head, next my dress showing Paris everything I would have liked to keep hidden. After l'Arc de Triomphe, we walked and walked. We walked along manicured streets lined with Gucci, Prada, Chanel, Dior. We marveled at the small bistros, the beautiful French women in their high heels and colorful dresses. We walked along the Seine, and we saw the Eiffel Tower from every imaginable view. 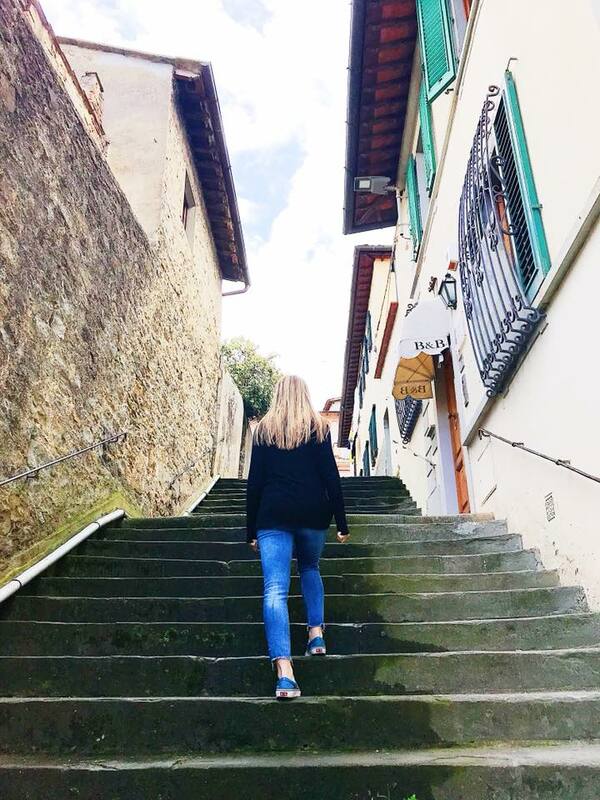 Finally, we ventured down a narrow French street that led us to some of the most delicious French Onion soup I have ever tasted. Tucked away in the small street was La Jacobine. It was small and cozy. The servers sing as they serve, the desserts are stacked high, and the onion soup comes out piping hot, with bubbling cheese, and toasted bread. Later, we found a macaroon shop called Macaron Gourmand. Anna tried her first ever macaroon, as she had been waiting until she stepped foot in Paris to ever eat one. The woman running the shop happily spoke to us in English (although, all I wanted was to practice my French on a patient person). She told us the macaroons are made fresh every morning, leaving out any artificial sources, and using ingredients that are sourced from around the world. The macaroons were delicate, creamy, and full of natural, delicious flavor. We walked the streets, eating macaroons and reveling in the beauty and charm that is Paris. We bought paintings of the city at a roadside market as the sun was beginning to lower in the sky. Everything was perfect. Everything was magic. In the middle of a trek to our next desired location, on a bridge over the Seine, with the sun low in the sky, Anna said, "this is the most relaxed I have ever felt in a new city". I couldn't agree more. I looked around, let out a sigh of relief, and realized that this moment was perfect. People were moving, eating, walking, laughing, drinking, and yet everything was so peaceful. The overall feeling was contentment, because we were in Paris, and what more could two young women ask for? We made our way to Palais de Chaillot to get an incredible view of the Eiffel Tower. We arrived as the sun was beginning to set and we marveled at the world-famous attraction as the sun lowered and people gathered to take pictures, or just revel in the dreamy, romantic sight. After finally making it back to the neighborhood where our Airbnb was located around 9 pm, we stumbled on Tante Eugénie. Warm, lit up, and happy to help us order a beautiful French meal. I had a white fish with satuéed mushrooms. We shared a bottle of house white wine and later a dessert of baked honeyed figs and a dollop of vanilla ice cream. We went home and drank red wine and watched a movie with all of the windows in the apartment open, allowing the sounds and the air from the Parisienne streets below to float in. On our final day in Paris, we decided to wake up early, get breakfast, and spend late morning in Le Musée d'Orsay. 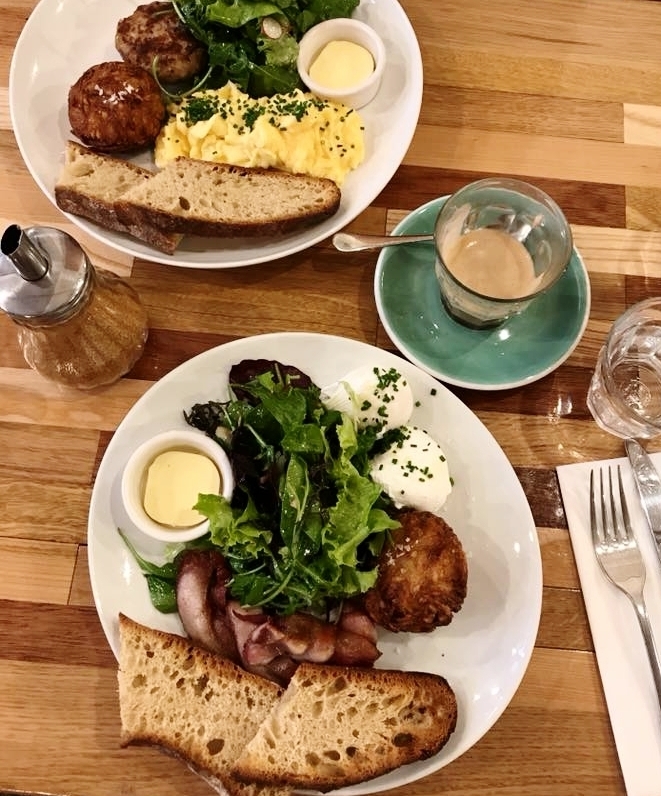 We had breakfast at HolyBelly 5, a hip eatery where we indulged in delicious poached eggs, sourdough toast, bacon, and the most delicious hashbrown I have ever tasted, and a latte on the side of course. Make sure to get there early, as when we were leaving the line was down the street. Next we slowly made our way to Le Musée d'Orsay. We marveled at the age old art by Van Gogh, Guillaumin, and Monet. Afterwards, it was time for more macaroons, so back to Macaron Gourmand we went. I bought new sunglasses from an old vintage shop and we continued to wander the streets in what became our favorite area of the city. After a final gander through the streets, we made our way to the airport and our Parisienne weekend came to a close. It is now December, and since the moment that I boarded that plane back to Prague, Paris has stayed in my mind and close to my heart. I will never forget that crisp and sunny October weekend. 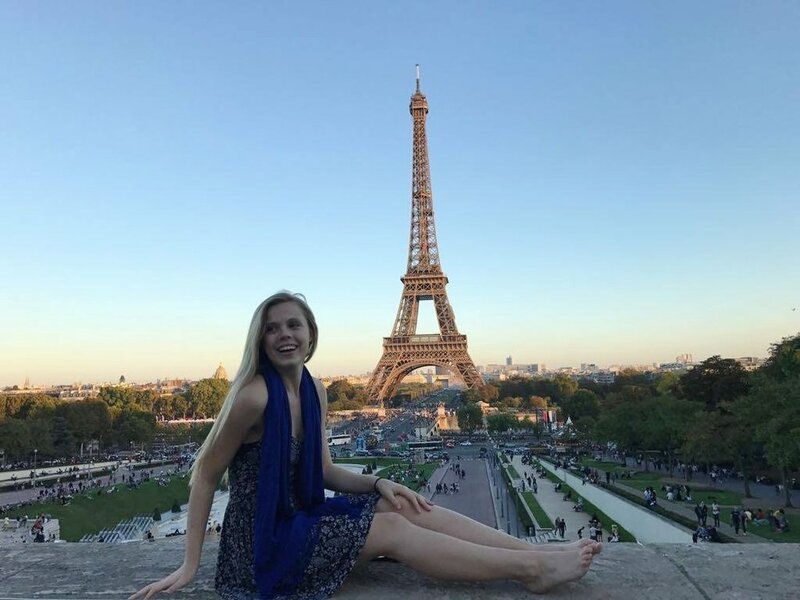 There are some memories that stick with you, comfort you, and remind you that somewhere in time you are a confused, curious, twenty-two year old, who is newly living abroad, drinking wine, and seeing Paris for the first time. And that is beautiful. Jan 3 Getting clear on intentions. Reflecting on big moves.